Lorin joined our team as an Intern Architect to assist Senior Architects in developing, documenting and coordinating design solutions to keep projects of the highest quality construction on schedule and on budget. She also aims to develop and maintain drafting standards and continue educational programming for licensed professionals throughout the project process. Lorin holds a Bachelor of Fine Arts Degree in Interior Architecture from Columbia College Chicago and an Associate Degree in Drafting & Design Technology from Robert Morris University. She obtains possesses strong knowledge in the software needed for her field such as AutoCAD, Revit, Autodesk 3dsMAX, Sketchup, Adobe InDesign, Illustrator, Photoshop, FF&E specification, space planning, and interior detailing. 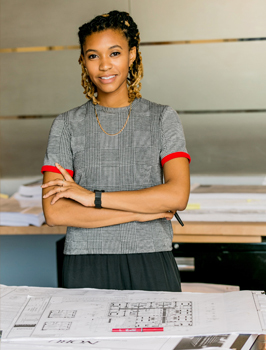 She is a member of The National Organization of Minority Architects (NOMA), Illinois chapter (I-NOMA), I-NOMA Marketing Coordinator, and Project Pipeline Volunteer (5-day Summer Camp Mentor and Design Build Instructor). When she is not studying buildings, she is passionate about music, exploration, the education and exposure of youths to new horizons, traveling, and experiencing new urban environments. Her hobbies include making music (trumpet, guitar, singing), biking, French speaking and culture, fashion, handmade objects, and home improvement.